This is a sort of coming of age tale of a curious and brave fish named Yuri. Little Yuri lives in a lake where he is loved by his parents and big brother. Yuri is always questioning and never takes no for an answer from his parents and teachers. 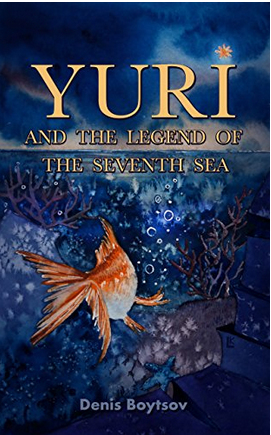 When he overhears his father tell of a hidden secret map that gives directions to the Seventh Sea, which is a paradise where fish live forever in peace without enemies or danger, Yuri immediately launches a search to find it. He is tired of dodging boats filled with humans, fish hooks, and larger sea creatures desiring to eat him. After embarking on his journey, Yuri meets up with many dangers but also makes the acquaintance of another fish named Otto who looks out for him. Yuri and Otto eventually find themselves at the entrance to the Seventh Sea. Now they must get through without wakening the Sea Serpent who will destroy them. Will Yuri survive and if he does, will he find that the paradise truly does exist? Yuri is an adorable character that children will love. He appears almost human with a personality much like a curious human. The dialogue among the characters is so realistic that readers will forget that Yuri is a fish. I found myself cheering for him to succeed. Children can see themselves in Yuri as he tests his limits, but also faces his fears. The illustrations are beautiful. While I did enjoy this book as an adult reader, I would especially recommend it to a middle-grade audience. If you enjoyed reading this post, please subscribe by clicking on the word Follow or by hitting the orange RSS FEED button in the upper-right hand corner of this page.